Tiahuanaco, was the capital of the Pre-Inca Civilization. It is also spelled Tiwanaku. The Inca Civilizations was an aboriginal American Indian culture that evolved in the Andean region (western South America) prior to Spanish exploration and conquest in the 16th century. The pre-Columbian civilization was extraordinary in its developments of human society and culture, ranking with the early civilizations of Egypt, Mesopotamia. There are several myths about Pre-Inca Civilizations. As with all ancient civilizations, legends and ancient stone carvings and monuments speak of creation by gods who came from the skies, yet no one is certain how any of these civilizations came into being. Many just seem to spring up as if out of no where. There is a pre-Incan legend that speaks of Viracocha who is depicted in many forms. There is a duality about this deity, which is not unlike gods in other civilizations - the good god and the warrior side to his personaity. We see him as he enlightened god in the white robes who brings knowledge and the warrior god with staves in his hands and a sun symbol around his head, not unlike the sun god Ra in ancient Egypt. As we third dimension is a duality - all things have good and evil charactistics - including the gods of all myths. 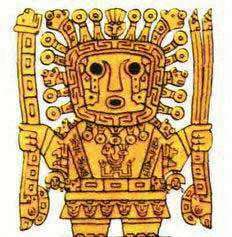 Viracocha - as duality is depicted as the sun god of creation [wearing a sun crown] and the moon god. Viracocha, as the feathered serpent god, is one of the great mysteries of ancient American cultures. He was called Kukulkan by the Mayas, Quetzalcoatl by the Aztecs, Viracocha by the Incas, Gucumatz in central America, Votan in Palenque and Zamna in Izamal. Pre-Inca religions centered in Tiahuanaco City which is where we first learn of a cult of a sky and thunder god named Viracocha. Gods with thunder bolts link with Zeus the main god of ancient Greece. Viracocha was generally depicted as having staves in both of his hands and anaureole around his head. The aureole suggests the qualities of a sun god, represented on the bas-relief in the upper part of the famous Sun Gate in Tiahuanaco as well as on ceramic. The staves, on the other hand, suggest Viracocha's distant ancestry from the nearly thousand years older Chaviacuten sky god in North Peru. His attendants were ranking deities in the shapes of cougar, condor, falcon and snake. Viracocha was worshipped as the main god in Huari as well. There his characteristics were apparently more militant. A head of Tiahuanaco state functioned both as a king and the arch-priest and he was revered as Viracocha's embodiment on Earth. Viracocha - and in some cases his 'men - was described as being a caucasian, bearded man in some writings, with white skin, hair on the face and beautiful emerald eyes in others wearing long white robes and sandals, carrying a staff, with a cougar lying at his feet. He was a kind and peace-loving god. The idea might refer to the Tiahuanaco's peaceful mission among the distant warrior cultures of Peru. According to the legend, however, evil people in short clothes came to the sacred lake and forced Viracocha to leave to north. On his departure they mocked and taunted him for his long robe and lenient disposition. Eventually, he had descended from the highlands to the coast and left over the ocean, promising to return some day. Viracocha, as a good deity, came to the Andes to restore civilization, culture and knowledge after the Flood. As with nearly all ancient peoples, Inca legend claims that the original people were flood survivors who by hiding in a hollow up on a very high mountain peak, were saved and repopulated the Earth. Viracocha is depicted by a water symbol that of the serpent or snake. This is not unlike other myths which mention aquatic gods who came from the heavens, went into the seas, then moved forth from the seas and created civilizations. Legends of the Aymara Indians say that the Creator God Viracocha rose from Lake Titicaca during the time of darkness to bring forth light. Viracocha was a storm god and a sun god who was represented as wearing the sun for a crown, with thunderbolts in his hands, and tears descending from his eyes as rain. He wandered the earth disguised as a beggar and wept when he saw the plight of the creatures he had created, but knew that he must sustain them. Viracocha made the earth, the stars, the sky and mankind, but his first creation displeased him, so he destroyed it with a flood and made a new, better one, taking to his wanderings as a beggar, teaching his new creations the rudiments of civilisation, as well as working numerous miracles. Viracocha eventually disappeared across the Pacific Ocean (by walking on the water), setting off near Manta Ecuador, and never returned. It was thought that Viracocha would re-appear in times of trouble. References are also found of a group of men named the suncasapa or bearded ones - they were the mythic soldiers of Viracocha, aka the 'angelic warriors of Viracocha'. 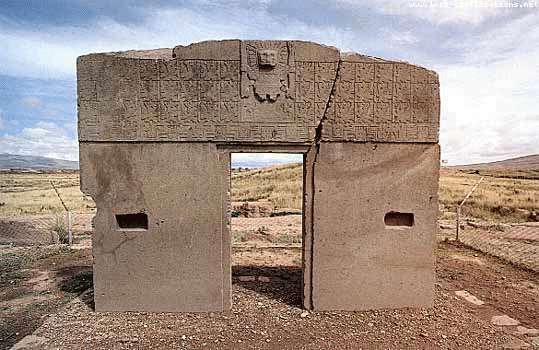 The famous carved figure on the decorated archway in the ancient (pre-Incan) city of Tiahuanaco, known as the "Gateway of the Sun," most likely represents Viracocha, flanked by 48 winged effigies, 32 with human faces and 16 with condor's heads. This huge monument is hewn from a single block of stone, and some believe that the strange symbols might represent a calendar, the oldest in the world. A huge monolithic figure, facing east in the direction of sunrise, stands as silent witness to an unknown civilization established around 2200 years ago. 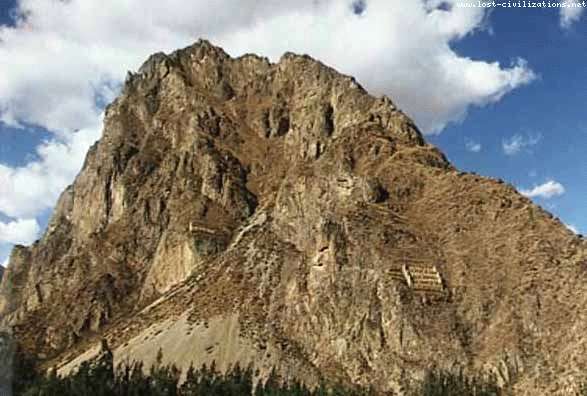 Across from the ruins of Ollantaytambo in the Urubamba Valley stands a sacred mountain believed to have the profile of Viracocha, the Inca sun god, carved into the stone. That which revolves in the Cycles of Time. Metaphors carved in stone - The Lion and the Lamb - a time of revelation. 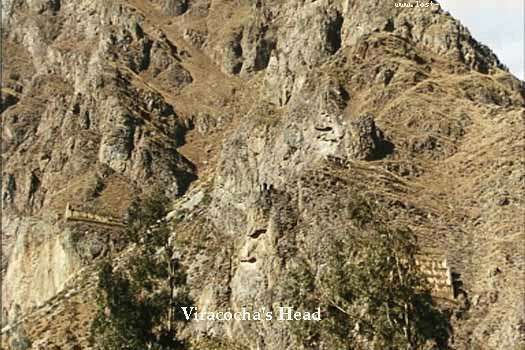 in the image where they illustrate vericocha on the mountain side you can make out what seems to be two line ascendig upwards at the end of these lines there resembles another face. I almost feel like that is not really vericocha but a pre incan looking at the sky where it depicts a man flying through the sky. hew that was a long comment. Actually, what you have shown isn't the face. The face can be seen (very indistincly) on the left hand side of the mountain towards the top. It is hard to see from a distance, but as we discovered while in Ollantaytambo, it it very clear as you get closer. This is really great for my project!!!! This is great for my project! Nose, eyes, beard??? are you kiddin me? This stuff is so interesting. It explains alot to me! i touch little egyption kidz,, ilove them as much as i love learning about king tuts put put! god that last comment was weird just like me! wat can you do!?! . hey georgia, katrina, zoe and morgan!! !lov you!! LOV you ALL!!!!! hey there hotties who's up 4 a little wohhwhoo!!! have you done your history? Nice inca pics here, bookmarked ! what the hell??? i need to no bout the danm incas!!!! I simply wanted to add that I have found and learned some new aspects concerning checking some very old european myths involving from our prehistoric EU civilizations. Thank You. WOOW, i like this site.